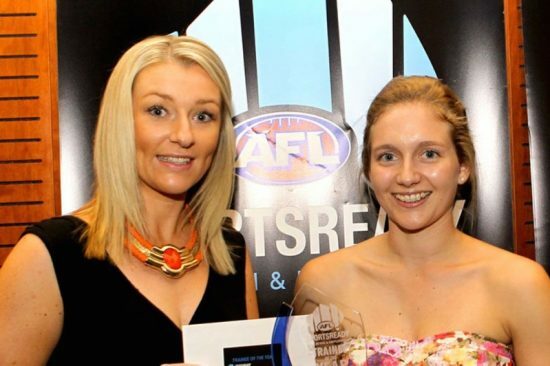 A Sunshine Coast teenager who showed exceptional leadership talent from the moment she started a traineeship with AFL Queensland has received the AFL SportsReady Busy at Work Trainee of the Year award at a special graduation ceremony in Brisbane. AFL SportsReady QLD State Manager Shane Johnson said Michelle Poetschka, who began her traineeship after completing Year 12 at the age of 16, stood out among a high achieving group of 56 trainees who graduated last night from across the state. Mr Johnson said the QLD graduates, including 22 young Indigenous trainees, had completed studies in areas across sport and recreation, business, financial services and horticulture, while undergoing traineeships at sporting organisations, golf courses and sports stadiums aquatic centres, banks, and with the AFL. Mr Johnson said Michelle had finished her QLD Certificate of Education at the age of 16, before choosing to complete Certificate III in Business with AFL SportsReady, using the qualification as a springboard into university. She is about to start studying at Sunshine Coast University while continuing to work part time with AFLQ-Sunshine Coast. “AFL SportsReady is passionate about helping young people create a rewarding career in sport, recreation, business and other industries and we are proud of the high number of our trainees who go on to further study or work in their chosen fields,” he said. Last night’s graduation dinner, held at the Cricketer’s Club at the GABBA, also awarded honours to a number of other AFL SportsReady trainee graduates, including Thomas Beverley, who received the HOSTPLUS Rising Star award for his work with the Gold Coast Suns. Other awards included the School-based Trainee of the Year, which was this year shared by two talented high school students, one from Brisbane and one from Hervey Bay. Mr Johnson said it was impossible to choose between Hervey Bay’s Knomie Drake, who completed a Certificate II in Retail as part of her QCE, and Jonah Chorley, from the Brisbane suburb of Morningside, whose Certificate III in Fitness studies also formed part of his studies during his last year at school. AFL SportsReady CEO James Montgomery said the company was proud to work in partnership with sporting organisations, clubs and other businesses across the state to ensure all graduates had the best chance at success beyond the sporting field. “It is a huge honour for me to present certificates to this year’s QLD graduates who come from all walks of life,” Mr Montgomery said. “The completion of their studies, whether it be at Certificate III, Certificate IV or Diploma level, along with the invaluable experience of a traineeship, will provide these students with a strong foundation for their future careers.” Mr Montgomery said it was also fantastic to see so many QLD graduates benefit from AFL SportsReady’s national partnerships with the ANZ, NAB, the Commonwealth Bank and Australia Post. IMAGE: Cassandra Horan, Busy at Work’s Senior Industry Training Consultant, presents Michelle Poetschka with the QLD Trainee of the Year award.